At 45, Vladimir Ryzhkov is one of the senior opposition figures. His Achilles Heel is his cautiousness – but that could again open political doors for him. “Neutral and harmless" is how opposition politician Boris Nemtsov describes Vladimir Ryzhkov. The characterization may sound like an insult, but it seems that Ryzhkov's neutrality is paying off. Thanks to Russia's recent political reform, his Republican Party, founded in 2007, is about to be reregistered, paving the way for Ryzhkov's possible return to parliamentary politics. At a recent protest, however, Ryzhkov looked nothing like a man interested in returning to the State Duma. He was in his element, leading the crowd like he did during the first democratic rallies he organised in his native Altai Region in Eastern Siberia. 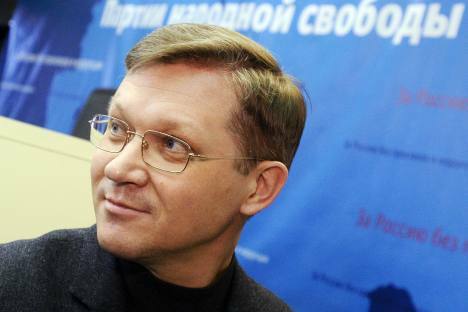 Ryzhkov, a historian by profession, acquired his political experience and the ability to choose his words correctly over the course of many years, as he moved from street democrat during the perestroika years to State Duma Deputy and Deputy Chairman of the pro-Yeltsin “Our Home is Russia” party. Ryzhkov entered the Duma in December 1993 at the age of 27. In 1997, he became deputy speaker of the parliament, and in 1998 was named deputy prime minister for social affairs by President Boris Yeltsin. But Ryzhkov declined the post because he lacked experience. His political opponents still accuse him of cooperating with the governments of both Yeltsin and Vladimir Putin. In response, Ryzhkov has said: “Yes, we made a lot of mistakes, but were looking to have a bigger market and more democracy. During my time there, the parliament was a place for discussion.” Ryzhkov stressed that he went into opposition and began to criticise the newly-elected Putin, immediately after the arrest of media mogul Vladimir Gusinsky in 2000. He calls himself the oldest opposition figure since he began to criticize Putin earlier than his closet rivals – Nemtsov and Mikhail Kasyanov. Ryzhkov remained a member of the Duma until 2007, when his Republican Party was dissolved. He has been in opposition ever since. He also teaches at the Moscow School of Economics, hosts a program on the Ekho Moskvy(Echo of Moscow) radio station, and writes articles for various newspapers. More than anything, Ryzhkov loves to talk about Tsar Alexander II, who abolished serfdom. “He initiated fantastic educational reforms, introduced high schools and a modern army. At that time, the economy flourished. Now Russia needs a leader like that, as well as the right environment,” Ryzhkov said. Ryzhkov looks younger than his 45 years. His biggest weakness is his alleged indecisiveness. As one of the organizers of the demonstrations, he was asked if the protestors might have been more successful had they taken bigger risks. “Putin and Medvedev were forced by pressure from politicians and ordinary citizens to make concessions,” Ryzhkov replied. He considers the laws on the liberalization of the political system one of the successes of the protest movement. “I know I’m considered indecisive. But you have to be careful and sometimes even indecisive if you don’t want to damage the crop. If I was a determined politician, I would have called for the storming of the Kremlin.” Ryzhkov has promised to keep participating in protests, regardless of how few people attend. But as a responsible politician, he believes that only dialogue can lead to change: “I will sit at the negotiating table even if I have rogues in front of me,” Ryzhkov said. Despite Ryzhkov’s harsh words about the Kremlin, Putin is less suspicious of Ryzhkov than he is of Nemtsov and Kasyanov. This may have to do with Ryzhkov's clearly dismissive attitude towards the nationalists who were also represented at the early demonstrations. He works with politicians with whom he does not agree and he sits with Sergei Udaltsov, the leader of the Left Front, in a working group for the reform of the political system, which is chaired by the deputy head of the presidential administration, Vyatsheslav Volodin.